Liberty Bell Park was located within the city limits of Philadelphia. It was a glass enclosed facility that could accommodate 30,0000. The grandstand had seating for 10,000, while the clubhouse seated 5,500, The clubhouse included a dinning room which could hold an additional 750 race goers. The stables could house 1,141 horses and there was parking for 10,000 cars. The original track configuration was a five eights mile oval under the lights for nighttime harness racing. On the evening of June 8th 1963 Majesty's Knight was the first horse ever to cross the finish line in a pari-mutual race in Pennsylvania. Liberty Bell was off and running before a crowd of 10,000 fans that was labeled as disappointing. From there Liberty Bell was on its way to becoming the premier harness track on the east coast. Over the years most of the leading horses and drivers performed at Liberty Bell Park. Besides being a great harness venue it also added thoroughbred racing for a few years. In 1968 thoroughbred racing was authorized in Pennsylvania, the only problem they had no place to run. The states three harness tracks came to the rescue and took on thoroughbred meets The Meadows and Pocono Downs conducted racing on their existing five eights mile ovals. Liberty Bell on the other hand built a mile oval around the existing oval with both tracks using the same stretch. Unfortunately the Pennsylvania Racing Commission said that each breed must run at separate tracks and dates could not be mixed. So thoroughbred racing lasted only five years at liberty Bell while Keystone Race Track was being built north of Philadelphia. 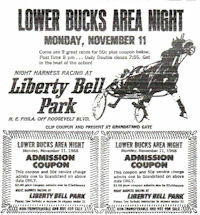 Once the thoroughbreds moved to Keystone, Liberty Bell returned exclusively to harness racing. By the time it returned as a harness tracks things were not as rosy as they used to be, the racing season that was split with Brandywine was starting to overlap and would eventually become a head to head war that neither track would survive. The final blow came when the new Garden State Park on the other side of the Ben Franklin Bridge revealed that it too would conduct harness racing. The site of Liberty Bell Park is now Franklin Mills Mall a small access road named Liberty Bell Drive is all that is left of the once prestigious track.